Another summer, another Elin HIlderbrand novel. This author is a fantastic go-to for beach reads — her books are light-hearted, gossip-filled, scandal-tinged peeks into the lives of Nantucket residents. Nantucket itself is as much a character as the people in her stories, and to fantastic effect. 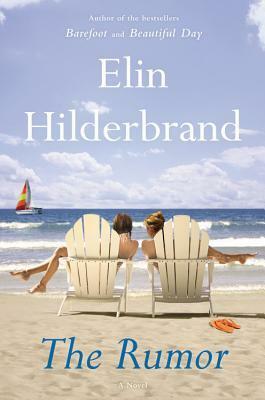 Reading a Hilderbrand feels like joining her characters’ community yourself, an island respite from real life, where you can lose yourself in the various adventures of the characters she has created. Her new book The Rumor delivers as expected, and is a delightful summer read. Nantucket writer Madeline King has to deliver a manuscript to her publisher ASAP, and she’s out of ideas. Enter her best friend Grace, who has something to confess about her ruggedly handsome landscape architect. Add to the mix Grace’s husband, whose money problems may have landed him in a situation way over his head, and a condo Madeline rents for writing inspiration and a “room of her own”. Mix in Grace and Madeline’s teenage children, who are dealing with sibling rivalries and love triangles. And of course, over it all is the Nantucket buzz, thrilled at all the juicy goings-on right in the neighbourhood. Reading my past reviews of Hildebrand’s books, I realize my response to her work has been pretty mixed. I thought Summerland took itself too seriously, but Beautiful Day was rather touching. The Rumor falls somewhat in between. It doesn’t quite achieve the emotional depth of Beautiful Day, but it doesn’t try to either. Rather, it’s simply a fun, breezy read that becomes surprisingly action-packed towards the end. Thank you to Hachette Book Group Canada for an ARC of this book in exchange for an honest review. This entry was posted in Book Reviews and tagged 50BookPledge2015, ARC, Fiction, HBG Canada by Jaclyn. Bookmark the permalink. I very much enjoy reading novels by Elin Hilderbrand since discovering her books @ Mitchell’s Bookstore on a visit to Nantucket (was looking for some “local flavour”). I am currently in the middle of her Winter Trilogy, but just discovered that her book coming out this Autumn (October 2017) entitled Winter Solstice will be BOTH a sequeal to that series as well as to The Rumor. Thought others here might appreciate that info.